Ashes of the Singularity: Escalation [GOG, Steam] recently gained Vulkan support in the 2.4 update along with tons of other new stuff. The interesting thing is that Linux is mentioned once again. Quote The Vulkan version also paves the way for a future Linux version. 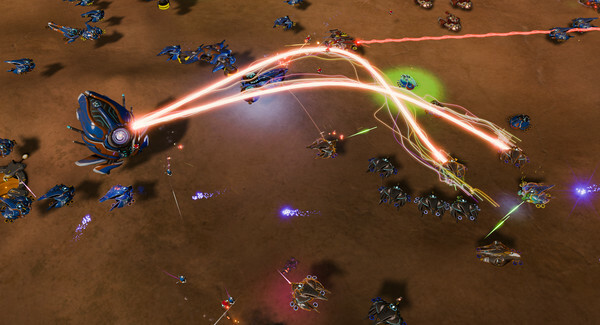 Getting Vulkan is a big step in making Ashes of the Singularity available on more platforms. Considering that was posted only ~2 hours ago, it's a damn good sign that it's being considered. I'm really looking forward to it, as it's exactly the type of strategy game I love and it would be pretty incredible to have such a title native on Linux. Considering their roadmap and the fact that Vulkan support in Ashes is still a work in progress, it may be quite some time until they're even ready to publicly say a Linux version is actually coming. Quote Play as the Post Human Coalition or their eternal foes the Substrate and battle for control of the galaxy. Experience maps of unprecedented size and detail with the unparalleled power of the world’s first native 64-bit RTS engine, Nitrous. Nitrous developers actually worked on Vulkan API design itself (they are members of the Vulkan working group). Which is kind of ironic, given how long it took them to add Vulkan support to Ashes of the Singularity. And the game is available on GOG too by the way. Been hoping this would get a Linux version before it was even released. Now that there is a dim of light, I hope it will not be threatened by the lack of Galaxy. I'm trying to decide if I still care about this game. I've just tried, you need to install Steam in x64 Virtual Environment (The game won't install in a 32bit Environment) and then switch on the Beta tab to "Opt-in - v2.40 Release"and install it. It starts up fine but currently I'm stuck in the loading screen. On the Steam forums they write that the first load could take longer, but I doubt it will take longer than 20 minutes. Also tried to kill the game and start it again without any success. I guess the game starts by default in DX11 mode and I have no idea if or how I can change that to use Vulkan. I've just renamed the AshesEscalation_Vulkan.exe to AshesEscalation.exe, which gets started by the launcher, still the game hangs in the loading screen for ever. Watch the GPU percent utilization for the 1080p comparison, then also the CPU utilization for the 3440x1440 comparison. Either Nvidia's Vulkan implementation is nowhere near as performant as the DX12 implementation, or Vulkan is not yet as optimized as DX12 in AotS' engine. I've seen a benchmark on youtube of this game where nvidia performs bad with Vulkan but AMD performs the same as DX12. It's the first build with Vulkan support and they also write that it's still in early shape. Just look how it evolved on Talos Principle. The first builds were slower than OpenGL, later builds were faster than OpenGL but slower than DX11 (on Windows) and again later it was finally faster than DX11. Those things will take time and a lot of work to improve. I wouldn't judge the implementation before it's in final state. I think we might get a client finally when nobody cares about the game anymore. Yay, exactly my type of RTS! Yay, no players playing multiplayer anymore when it does arrive!